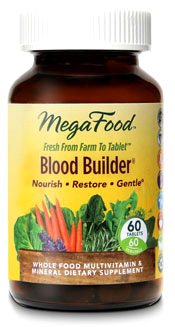 Blood Builder, 60 tablets (Mega Food) - Penn Herb Co. Ltd.
MegaFood Blood Builder® is a whole food iron supplement designed to help maintain healthy iron levels and red blood cell production. Blood Builder is herb-free and suitable for use during pregnancy and breastfeeding. Blood Builder provides the recommended daily requirements of non-heme iron, folate and B12. It also contains vitamin C to enhance iron bioavailability and utilization plus organic beet root, traditionally known to nourish, purify and strengthen the blood. 1 tablet daily. May be taken any time throughout the day, even on an empty stomach.